"IMF" redirects here. For other uses, see IMF (disambiguation). The International Monetary Fund (IMF) is an international organization headquartered in Washington, D.C., consisting of "189 countries working to foster global monetary cooperation, secure financial stability, facilitate international trade, promote high employment and sustainable economic growth, and reduce poverty around the world." Formed in 1944 at the Bretton Woods Conference primarily by the ideas of Harry Dexter White and John Maynard Keynes, it came into formal existence in 1945 with 29 member countries and the goal of reconstructing the international payment system. It now plays a central role in the management of balance of payments difficulties and international financial crises. Countries contribute funds to a pool through a quota system from which countries experiencing balance of payments problems can borrow money. As of 2016[update], the fund had SDR477 billion (about $667 billion). Through the fund, and other activities such as the gathering of statistics and analysis, surveillance of its members' economies and the demand for particular policies, the IMF works to improve the economies of its member countries. The organisation's objectives stated in the Articles of Agreement are: to promote international monetary co-operation, international trade, high employment, exchange-rate stability, sustainable economic growth, and making resources available to member countries in financial difficulty. IMF funds come from two major sources:quotas and loans. Quotas, which are pooled funds of member nations, generate most IMF funds. The size of a member's quota depends on its economic and financial importance in the world. Nations with larger economic importance have larger quotas. The quotas are increased periodically as a means of boosting the IMF's resources. 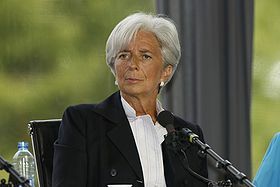 The current Managing Director (MD) and Chairwoman of the International Monetary Fund is French lawyer and former politician, Christine Lagarde, who has held the post since 5 July 2011. According to the IMF itself, it works to foster global growth and economic stability by providing policy advice and financing the members by working with developing nations to help them achieve macroeconomic stability and reduce poverty. The rationale for this is that private international capital markets function imperfectly and many countries have limited access to financial markets. Such market imperfections, together with balance-of-payments financing, provide the justification for official financing, without which many countries could only correct large external payment imbalances through measures with adverse economic consequences. The IMF provides alternate sources of financing. Upon the founding of the IMF, its three primary functions were: to oversee the fixed exchange rate arrangements between countries, thus helping national governments manage their exchange rates and allowing these governments to prioritize economic growth, and to provide short-term capital to aid the balance of payments. This assistance was meant to prevent the spread of international economic crises. The IMF was also intended to help mend the pieces of the international economy after the Great Depression and World War II. As well, to provide capital investments for economic growth and projects such as infrastructure. The IMF's role was fundamentally altered by the floating exchange rates post-1971. It shifted to examining the economic policies of countries with IMF loan agreements to determine if a shortage of capital was due to economic fluctuations or economic policy. The IMF also researched what types of government policy would ensure economic recovery. A particular concern of the IMF was to prevent financial crisis, such as those in Mexico 1982, Brazil in 1987, East Asia in 1997–98 and Russia in 1998, from spreading and threatening the entire global financial and currency system. The challenge was to promote and implement policy that reduced the frequency of crises among the emerging market countries, especially the middle-income countries which are vulnerable to massive capital outflows. Rather than maintaining a position of oversight of only exchange rates, their function became one of surveillance of the overall macroeconomic performance of member countries. Their role became a lot more active because the IMF now manages economic policy rather than just exchange rates. In addition, the IMF negotiates conditions on lending and loans under their policy of conditionality, which was established in the 1950s. Low-income countries can borrow on concessional terms, which means there is a period of time with no interest rates, through the Extended Credit Facility (ECF), the Standby Credit Facility (SCF) and the Rapid Credit Facility (RCF). Nonconcessional loans, which include interest rates, are provided mainly through Stand-By Arrangements (SBA), the Flexible Credit Line (FCL), the Precautionary and Liquidity Line (PLL), and the Extended Fund Facility. The IMF provides emergency assistance via the Rapid Financing Instrument (RFI) to members facing urgent balance-of-payments needs. The IMF is mandated to oversee the international monetary and financial system and monitor the economic and financial policies of its member countries. This activity is known as surveillance and facilitates international co-operation. Since the demise of the Bretton Woods system of fixed exchange rates in the early 1970s, surveillance has evolved largely by way of changes in procedures rather than through the adoption of new obligations. The responsibilities changed from those of guardian to those of overseer of members' policies. The Fund typically analyses the appropriateness of each member country's economic and financial policies for achieving orderly economic growth, and assesses the consequences of these policies for other countries and for the global economy. In 1995 the International Monetary Fund began work on data dissemination standards with the view of guiding IMF member countries to disseminate their economic and financial data to the public. The International Monetary and Financial Committee (IMFC) endorsed the guidelines for the dissemination standards and they were split into two tiers: The General Data Dissemination System (GDDS) and the Special Data Dissemination Standard (SDDS). The executive board approved the SDDS and GDDS in 1996 and 1997 respectively, and subsequent amendments were published in a revised Guide to the General Data Dissemination System. The system is aimed primarily at statisticians and aims to improve many aspects of statistical systems in a country. It is also part of the World Bank Millennium Development Goals and Poverty Reduction Strategic Papers. The primary objective of the GDDS is to encourage member countries to build a framework to improve data quality and statistical capacity building to evaluate statistical needs, set priorities in improving the timeliness, transparency, reliability and accessibility of financial and economic data. Some countries initially used the GDDS, but later upgraded to SDDS. IMF conditionality is a set of policies or conditions that the IMF requires in exchange for financial resources. The IMF does require collateral from countries for loans but also requires the government seeking assistance to correct its macroeconomic imbalances in the form of policy reform. If the conditions are not met, the funds are withheld. The concept of conditionality was introduced in a 1952 Executive Board decision and later incorporated into the Articles of Agreement. Conditionality is associated with economic theory as well as an enforcement mechanism for repayment. Stemming primarily from the work of Jacques Polak, the theoretical underpinning of conditionality was the "monetary approach to the balance of payments". Cutting expenditures, also known as austerity. Improving governance and fighting corruption. These conditions are known as the Washington Consensus. These loan conditions ensure that the borrowing country will be able to repay the IMF and that the country will not attempt to solve their balance-of-payment problems in a way that would negatively impact the international economy. The incentive problem of moral hazard—when economic agents maximise their own utility to the detriment of others because they do not bear the full consequences of their actions—is mitigated through conditions rather than providing collateral; countries in need of IMF loans do not generally possess internationally valuable collateral anyway. Conditionality also reassures the IMF that the funds lent to them will be used for the purposes defined by the Articles of Agreement and provides safeguards that country will be able to rectify its macroeconomic and structural imbalances. In the judgment of the IMF, the adoption by the member of certain corrective measures or policies will allow it to repay the IMF, thereby ensuring that the resources will be available to support other members. As of 2004[update], borrowing countries have had a very good track record for repaying credit extended under the IMF's regular lending facilities with full interest over the duration of the loan. This indicates that IMF lending does not impose a burden on creditor countries, as lending countries receive market-rate interest on most of their quota subscription, plus any of their own-currency subscriptions that are loaned out by the IMF, plus all of the reserve assets that they provide the IMF. This breakdown in international monetary co-operation created a need for oversight. The representatives of 45 governments met at the Bretton Woods Conference in the Mount Washington Hotel in Bretton Woods, New Hampshire, in the United States, to discuss a framework for postwar international economic co-operation and how to rebuild Europe. There were two views on the role the IMF should assume as a global economic institution. American delegate Harry Dexter White foresaw an IMF that functioned more like a bank, making sure that borrowing states could repay their debts on time. Most of White's plan was incorporated into the final acts adopted at Bretton Woods. British economist John Maynard Keynes imagined that the IMF would be a cooperative fund upon which member states could draw to maintain economic activity and employment through periodic crises. This view suggested an IMF that helped governments and to act as the United States government had during the New Deal in response to World War II. The IMF formally came into existence on 27 December 1945, when the first 29 countries ratified its Articles of Agreement. By the end of 1946 the IMF had grown to 39 members. 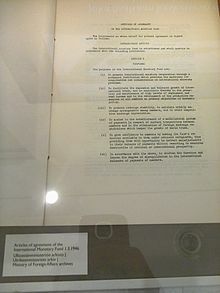 On 1 March 1947, the IMF began its financial operations, and on 8 May France became the first country to borrow from it. The IMF was one of the key organisations of the international economic system; its design allowed the system to balance the rebuilding of international capitalism with the maximisation of national economic sovereignty and human welfare, also known as embedded liberalism. The IMF's influence in the global economy steadily increased as it accumulated more members. The increase reflected in particular the attainment of political independence by many African countries and more recently the 1991 dissolution of the Soviet Union because most countries in the Soviet sphere of influence did not join the IMF. The Bretton Woods system prevailed until 1971, when the United States government suspended the convertibility of the US$ (and dollar reserves held by other governments) into gold. This is known as the Nixon Shock. The changes to the IMF articles of agreement reflecting these changes were ratified by the 1976 Jamaica Accords. The IMF provided two major lending packages in the early 2000s to Argentina (during the 1998–2002 Argentine great depression) and Uruguay (after the 2002 Uruguay banking crisis). However, by the mid-2000s, IMF lending was at its lowest share of world GDP since the 1970s. In May 2010, the IMF participated, in 3:11 proportion, in the first Greek bailout that totalled €110 billion, to address the great accumulation of public debt, caused by continuing large public sector deficits. As part of the bailout, the Greek government agreed to adopt austerity measures that would reduce the deficit from 11% in 2009 to "well below 3%" in 2014. The bailout did not include debt restructuring measures such as a haircut, to the chagrin of the Swiss, Brazilian, Indian, Russian, and Argentinian Directors of the IMF, with the Greek authorities themselves (at the time, PM George Papandreou and Finance Minister Giorgos Papakonstantinou) ruling out a haircut. A second bailout package of more than €100 billion was agreed over the course of a few months from October 2011, during which time Papandreou was forced from office. The so-called Troika, of which the IMF is part, are joint managers of this programme, which was approved by the Executive Directors of the IMF on 15 March 2012 for SDR23.8 billion, and which saw private bondholders take a haircut of upwards of 50%. In the interval between May 2010 and February 2012 the private banks of Holland, France and Germany reduced exposure to Greek debt from €122 billion to €66 billion. As of January 2012[update], the largest borrowers from the IMF in order were Greece, Portugal, Ireland, Romania, and Ukraine. On 25 March 2013, a €10 billion international bailout of Cyprus was agreed by the Troika, at the cost to the Cypriots of its agreement: to close the country's second-largest bank; to impose a one-time bank deposit levy on Bank of Cyprus uninsured deposits. No insured deposit of €100k or less were to be affected under the terms of a novel bail-in scheme. The topic of sovereign debt restructuring was taken up by the IMF in April 2013 for the first time since 2005, in a report entitled "Sovereign Debt Restructuring: Recent Developments and Implications for the Fund's Legal and Policy Framework". The paper, which was discussed by the board on 20 May, summarised the recent experiences in Greece, St Kitts and Nevis, Belize, and Jamaica. An explanatory interview with Deputy Director Hugh Bredenkamp was published a few days later, as was a deconstruction by Matina Stevis of the Wall Street Journal. In the October 2013 Fiscal Monitor publication, the IMF suggested that a capital levy capable of reducing Euro-area government debt ratios to "end-2007 levels" would require a very high tax rate of about 10%. The Fiscal Affairs department of the IMF, headed at the time by Acting Director Sanjeev Gupta, produced a January 2014 report entitled "Fiscal Policy and Income Inequality" that stated that "Some taxes levied on wealth, especially on immovable property, are also an option for economies seeking more progressive taxation ... Property taxes are equitable and efficient, but underutilized in many economies ... There is considerable scope to exploit this tax more fully, both as a revenue source and as a redistributive instrument." At the end of March 2014, the IMF secured an $18 billion bailout fund for the provisional government of Ukraine in the aftermath of the 2014 Ukrainian revolution. Not all member countries of the IMF are sovereign states, and therefore not all "member countries" of the IMF are members of the United Nations. Amidst "member countries" of the IMF that are not member states of the UN are non-sovereign areas with special jurisdictions that are officially under the sovereignty of full UN member states, such as Aruba, Curaçao, Hong Kong, and Macau, as well as Kosovo. The corporate members appoint ex-officio voting members, who are listed below. All members of the IMF are also International Bank for Reconstruction and Development (IBRD) members and vice versa. Former members are Cuba (which left in 1964), and the Republic of China (Taiwan), which was ejected from the UN in 1980 after losing the support of then United States President Jimmy Carter and was replaced by the People's Republic of China. However, "Taiwan Province of China" is still listed in the official IMF indices. Apart from Cuba, the other UN states that do not belong to the IMF are Andorra, Liechtenstein, Monaco and North Korea. The former Czechoslovakia was expelled in 1954 for "failing to provide required data" and was readmitted in 1990, after the Velvet Revolution. Poland withdrew in 1950—allegedly pressured by the Soviet Union—but returned in 1986. Any country may apply to be a part of the IMF. Post-IMF formation, in the early postwar period, rules for IMF membership were left relatively loose. Members needed to make periodic membership payments towards their quota, to refrain from currency restrictions unless granted IMF permission, to abide by the Code of Conduct in the IMF Articles of Agreement, and to provide national economic information. However, stricter rules were imposed on governments that applied to the IMF for funding. The countries that joined the IMF between 1945 and 1971 agreed to keep their exchange rates secured at rates that could be adjusted only to correct a "fundamental disequilibrium" in the balance of payments, and only with the IMF's agreement. Some members have a very difficult relationship with the IMF and even when they are still members they do not allow themselves to be monitored. 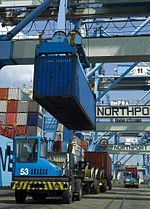 Member countries of the IMF have access to information on the economic policies of all member countries, the opportunity to influence other members' economic policies, technical assistance in banking, fiscal affairs, and exchange matters, financial support in times of payment difficulties, and increased opportunities for trade and investment. The Board of Governors consists of one governor and one alternate governor for each member country. Each member country appoints its two governors. The Board normally meets once a year and is responsible for electing or appointing executive directors to the Executive Board. While the Board of Governors is officially responsible for approving quota increases, Special Drawing Right allocations, the admittance of new members, compulsory withdrawal of members, and amendments to the Articles of Agreement and By-Laws, in practice it has delegated most of its powers to the IMF's Executive Board. The Board of Governors is advised by the International Monetary and Financial Committee and the Development Committee. The International Monetary and Financial Committee has 24 members and monitors developments in global liquidity and the transfer of resources to developing countries. The Development Committee has 25 members and advises on critical development issues and on financial resources required to promote economic development in developing countries. They also advise on trade and environmental issues. The Board of Governors reports directly to the Managing Director of the IMF, Christine Lagarde. 24 Executive Directors make up the Executive Board. The Executive Directors represent all 189 member countries in a geographically based roster. Countries with large economies have their own Executive Director, but most countries are grouped in constituencies representing four or more countries. 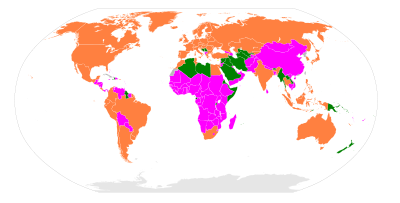 Following the 2008 Amendment on Voice and Participation which came into effect in March 2011, seven countries each appoint an Executive Director: the United States, Japan, China, Germany, France, the United Kingdom, and Saudi Arabia. The remaining 17 Directors represent constituencies consisting of 2 to 23 countries. This Board usually meets several times each week. The Board membership and constituency is scheduled for periodic review every eight years. The IMF is led by a managing director, who is head of the staff and serves as Chairman of the Executive Board. The managing director is assisted by a First Deputy managing director and three other Deputy Managing Directors. Historically the IMF's managing director has been European and the president of the World Bank has been from the United States. However, this standard is increasingly being questioned and competition for these two posts may soon open up to include other qualified candidates from any part of the world. In 2011 the world's largest developing countries, the BRIC nations, issued a statement declaring that the tradition of appointing a European as managing director undermined the legitimacy of the IMF and called for the appointment to be merit-based. Previous managing director Dominique Strauss-Kahn was arrested in connection with charges of sexually assaulting a New York hotel room attendant and resigned on 18 May. The charges were later dropped. On 28 June 2011 Christine Lagarde was confirmed as managing director of the IMF for a five-year term starting on 5 July 2011. She was re-elected by consensus for a second five-year term, starting 5 July 2016, being the only candidate nominated for the post of Managing Director. Voting power in the IMF is based on a quota system. Each member has a number of basic votes (each member's number of basic votes equals 5.502% of the total votes), plus one additional vote for each Special Drawing Right (SDR) of 100,000 of a member country's quota. The Special Drawing Right is the unit of account of the IMF and represents a claim to currency. It is based on a basket of key international currencies. The basic votes generate a slight bias in favour of small countries, but the additional votes determined by SDR outweigh this bias. Changes in the voting shares require approval by a supermajority of 85% of voting power. all 188 members' quotas will increase from a total of about SDR 238.5 billion to about SDR 477 billion, while the quota shares and voting power of the IMF's poorest member countries will be protected. more than 6 percent of quota shares will shift to dynamic emerging market and developing countries and also from over-represented to under-represented members. four emerging market countries (Brazil, China, India, and Russia) will be among the ten largest members of the IMF. Other top 10 members are the United States, Japan, Germany, France, the United Kingdom and Italy. The IMF's quota system was created to raise funds for loans. Each IMF member country is assigned a quota, or contribution, that reflects the country's relative size in the global economy. Each member's quota also determines its relative voting power. Thus, financial contributions from member governments are linked to voting power in the organisation. This system follows the logic of a shareholder-controlled organisation: wealthy countries have more say in the making and revision of rules. Since decision making at the IMF reflects each member's relative economic position in the world, wealthier countries that provide more money to the IMF have more influence than poorer members that contribute less; nonetheless, the IMF focuses on redistribution. Quotas are normally reviewed every five years and can be increased when deemed necessary by the Board of Governors. IMF voting shares are relatively inflexible: countries that grow economically have tended to become under-represented as their voting power lags behind. Currently, reforming the representation of developing countries within the IMF has been suggested. These countries' economies represent a large portion of the global economic system but this is not reflected in the IMF's decision making process through the nature of the quota system. Joseph Stiglitz argues, "There is a need to provide more effective voice and representation for developing countries, which now represent a much larger portion of world economic activity since 1944, when the IMF was created." In 2008, a number of quota reforms were passed including shifting 6% of quota shares to dynamic emerging markets and developing countries. The IMF's membership is divided along income lines: certain countries provide the financial resources while others use these resources. Both developed country "creditors" and developing country "borrowers" are members of the IMF. The developed countries provide the financial resources but rarely enter into IMF loan agreements; they are the creditors. Conversely, the developing countries use the lending services but contribute little to the pool of money available to lend because their quotas are smaller; they are the borrowers. Thus, tension is created around governance issues because these two groups, creditors and borrowers, have fundamentally different interests. The criticism is that the system of voting power distribution through a quota system institutionalises borrower subordination and creditor dominance. The resulting division of the IMF's membership into borrowers and non-borrowers has increased the controversy around conditionality because the borrowers are interested in increasing loan access while creditors want to maintain reassurance that the loans will be repaid. A recent[when?] source revealed that the average overall use of IMF credit per decade increased, in real terms, by 21% between the 1970s and 1980s, and increased again by just over 22% from the 1980s to the 1991–2005 period. Another study has suggested that since 1950 the continent of Africa alone has received $300 billion from the IMF, the World Bank, and affiliate institutions. A study by Bumba Mukherjee found that developing democratic countries benefit more from IMF programs than developing autocratic countries because policy-making, and the process of deciding where loaned money is used, is more transparent within a democracy. One study done by Randall Stone found that although earlier studies found little impact of IMF programs on balance of payments, more recent studies using more sophisticated methods and larger samples "usually found IMF programs improved the balance of payments". The Exceptional Access Framework was created in 2003 when John B. Taylor was Under Secretary of the US Treasury for International Affairs. The new Framework became fully operational in February 2003 and it was applied in the subsequent decisions on Argentina and Brazil. Its purpose was to place some sensible rules and limits on the way the IMF makes loans to support governments with debt problem—especially in emerging markets—and thereby move away from the bailout mentality of the 1990s. Such a reform was essential for ending the crisis atmosphere that then existed in emerging markets. The reform was closely related to, and put in place nearly simultaneously with, the actions of several emerging market countries to place collective action clauses in their bond contracts. In 2010, the framework was abandoned so the IMF could make loans to Greece in an unsustainable and political situation. The topic of sovereign debt restructuring was taken up by IMF staff in April 2013 for the first time since 2005, in a report entitled "Sovereign Debt Restructuring: Recent Developments and Implications for the Fund's Legal and Policy Framework". The paper, which was discussed by the board on 20 May, summarised the recent experiences in Greece, St Kitts and Nevis, Belize and Jamaica. An explanatory interview with Deputy Director Hugh Bredenkamp was published a few days later, as was a deconstruction by Matina Stevis of the Wall Street Journal. The staff was directed to formulate an updated policy, which was accomplished on 22 May 2014 with a report entitled "The Fund's Lending Framework and Sovereign Debt: Preliminary Considerations", and taken up by the Executive Board on 13 June. The staff proposed that "in circumstances where a (Sovereign) member has lost market access and debt is considered sustainable ... the IMF would be able to provide Exceptional Access on the basis of a debt operation that involves an extension of maturities", which was labelled a "reprofiling operation". These reprofiling operations would "generally be less costly to the debtor and creditors—and thus to the system overall—relative to either an upfront debt reduction operation or a bail-out that is followed by debt reduction ... (and) would be envisaged only when both (a) a member has lost market access and (b) debt is assessed to be sustainable, but not with high probability ... Creditors will only agree if they understand that such an amendment is necessary to avoid a worse outcome: namely, a default and/or an operation involving debt reduction ... Collective action clauses, which now exist in most—but not all—bonds, would be relied upon to address collective action problems." Globalization encompasses three institutions: global financial markets and transnational companies, national governments linked to each other in economic and military alliances led by the United States, and rising "global governments" such as World Trade Organization (WTO), IMF, and World Bank. Charles Derber argues in his book People Before Profit, "These interacting institutions create a new global power system where sovereignty is globalized, taking power and constitutional authority away from nations and giving it to global markets and international bodies". Titus Alexander argues that this system institutionalises global inequality between western countries and the Majority World in a form of global apartheid, in which the IMF is a key pillar. The establishment of globalised economic institutions has been both a symptom of and a stimulus for globalisation. 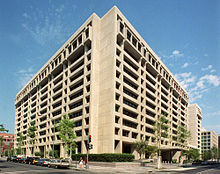 The development of the World Bank, the IMF regional development banks such as the European Bank for Reconstruction and Development (EBRD), and multilateral trade institutions such as the WTO signals a move away from the dominance of the state as the primary actor analyzed in international affairs. Globalization has thus been transformative in terms of a reconceptualising of state sovereignty. Following United States President Bill Clinton's administration's aggressive financial deregulation campaign in the 1990s, globalisation leaders overturned longstanding restrictions by governments that limited foreign ownership of their banks, deregulated currency exchange, and eliminated restrictions on how quickly money could be withdrawn by foreign investors. An IMF report from May 2015 estimated that the world's governments directly and indirectly subsidise fossil fuel companies with $5.3tn (£3.4tn) a year. The measurement accounts for the unpaid costs that polluters impose on governments by the burning of coal, oil, and gas. The projected impacts of fossil fuel subsidies on populations—air pollution, health problems, floods, droughts, and storms driven by climate change—account for over half of the reported global expenditure. Overseas Development Institute (ODI) research undertaken in 1980 included criticisms of the IMF which support the analysis that it is a pillar of what activist Titus Alexander calls global apartheid. Developed countries were seen to have a more dominant role and control over less developed countries (LDCs). The Fund worked on the incorrect assumption that all payments disequilibria were caused domestically. The Group of 24 (G-24), on behalf of LDC members, and the United Nations Conference on Trade and Development (UNCTAD) complained that the IMF did not distinguish sufficiently between disequilibria with predominantly external as opposed to internal causes. This criticism was voiced in the aftermath of the 1973 oil crisis. Then LDCs found themselves with payments deficits due to adverse changes in their terms of trade, with the Fund prescribing stabilisation programmes similar to those suggested for deficits caused by government over-spending. Faced with long-term, externally generated disequilibria, the G-24 argued for more time for LDCs to adjust their economies. Some IMF policies may be anti-developmental; the report said that deflationary effects of IMF programmes quickly led to losses of output and employment in economies where incomes were low and unemployment was high. Moreover, the burden of the deflation is disproportionately borne by the poor. The IMF's initial policies were based in theory and influenced by differing opinions and departmental rivalries. Critics suggest that its intentions to implement these policies in countries with widely varying economic circumstances were misinformed and lacked economic rationale. ODI conclusions were that the IMF's very nature of promoting market-oriented approaches attracted unavoidable criticism. On the other hand, the IMF could serve as a scapegoat while allowing governments to blame international bankers. The ODI conceded that the IMF was insensitive to political aspirations of LDCs, while its policy conditions were inflexible. Argentina, which had been considered by the IMF to be a model country in its compliance to policy proposals by the Bretton Woods institutions, experienced a catastrophic economic crisis in 2001, which some believe to have been caused by IMF-induced budget restrictions—which undercut the government's ability to sustain national infrastructure even in crucial areas such as health, education, and security—and privatisation of strategically vital national resources. Others attribute the crisis to Argentina's misdesigned fiscal federalism, which caused subnational spending to increase rapidly. The crisis added to widespread hatred of this institution in Argentina and other South American countries, with many blaming the IMF for the region's economic problems. The current—as of early 2006—trend toward moderate left-wing governments in the region and a growing concern with the development of a regional economic policy largely independent of big business pressures has been ascribed to this crisis. In 2006, a senior ActionAid policy analyst Akanksha Marphatia stated that IMF policies in Africa undermine any possibility of meeting the Millennium Development Goals (MDGs) due to imposed restrictions that prevent spending on important sectors, such as education and health. In an interview (2008-05-19), the former Romanian Prime Minister Călin Popescu-Tăriceanu claimed that "Since 2005, IMF is constantly making mistakes when it appreciates the country's economic performances". Former Tanzanian President Julius Nyerere, who claimed that debt-ridden African states were ceding sovereignty to the IMF and the World Bank, famously asked, "Who elected the IMF to be the ministry of finance for every country in the world?" Former chief economist of IMF and former Reserve Bank of India (RBI) Governor Raghuram Rajan who predicted Financial crisis of 2007–08 criticised IMF for remaining a sideline player to the Developed world. He criticised IMF for praising the monetary policies of the US, which he believed were wreaking havoc in emerging markets. He had been critical of the ultra-loose money policies of the Western nations and IMF. Countries such as Zambia have not received proper aid with long-lasting effects, leading to concern from economists. Since 2005, Zambia (as well as 29 other African countries) did receive debt write-offs, which helped with the country's medical and education funds. However, Zambia returned to a debt of over half its GDP in less than a decade. American economist William Easterly, skeptical of the IMF's methods, had initially warned that "debt relief would simply encourage more reckless borrowing by crooked governments unless it was accompanied by reforms to speed up economic growth and improve governance," according to The Economist. The IMF has been criticised for being "out of touch" with local economic conditions, cultures, and environments in the countries they are requiring policy reform. The economic advice the IMF gives might not always take into consideration the difference between what spending means on paper and how it is felt by citizens. Jeffrey Sachs argues that the IMF's "usual prescription is 'budgetary belt tightening to countries who are much too poor to own belts'". Sachs[Or who says it?] wrote that the IMF's role as a generalist institution specialising in macroeconomic issues needs reform. Conditionality has also been criticised because a country can pledge collateral of "acceptable assets" to obtain waivers—if one assumes that all countries are able to provide "acceptable collateral". One view is that conditionality undermines domestic political institutions. The recipient governments are sacrificing policy autonomy in exchange for funds, which can lead to public resentment of the local leadership for accepting and enforcing the IMF conditions. Political instability can result from more leadership turnover as political leaders are replaced in electoral backlashes. IMF conditions are often criticised for reducing government services, thus increasing unemployment. Another criticism is that IMF programs are only designed to address poor governance, excessive government spending, excessive government intervention in markets, and too much state ownership. This assumes that this narrow range of issues represents the only possible problems; everything is standardised and differing contexts are ignored. A country may also be compelled to accept conditions it would not normally accept had they not been in a financial crisis in need of assistance. On top of that, regardless of what methodologies and data sets used, it comes to same the conclusion of exacerbating income inequality. With Gini coefficient, it became clear that countries with IMF programs face increased income inequality. It is claimed that conditionalities retard social stability and hence inhibit the stated goals of the IMF, while Structural Adjustment Programs lead to an increase in poverty in recipient countries. The IMF sometimes advocates "austerity programmes", cutting public spending and increasing taxes even when the economy is weak, to bring budgets closer to a balance, thus reducing budget deficits. Countries are often advised to lower their corporate tax rate. In Globalization and Its Discontents, Joseph E. Stiglitz, former chief economist and senior vice-president at the World Bank, criticises these policies. He argues that by converting to a more monetarist approach, the purpose of the fund is no longer valid, as it was designed to provide funds for countries to carry out Keynesian reflations, and that the IMF "was not participating in a conspiracy, but it was reflecting the interests and ideology of the Western financial community." Stiglitz concludes, "Modern high-tech warfare is designed to remove physical contact: dropping bombs from 50,000 feet ensures that one does not 'feel' what one does. Modern economic management is similar: from one's luxury hotel, one can callously impose policies about which one would think twice if one knew the people whose lives one was destroying." Following the exigencies of the governments of the richest companies, the IMF, permitted countries in crisis to borrow in order to avoid default on their repayments. Caught in the debt's downward spiral, developing countries soon had no other recourse than to take on new debt in order to repay the old debt. Before providing them with new loans, at higher interest rates, future leaders asked the IMF, to intervene with the guarantee of ulterior reimbursement, asking for a signed agreement with the said countries. The IMF thus agreed to restart the flow of the 'finance pump' on condition that the concerned countries first use this money to reimburse banks and other private lenders, while restructuring their economy at the IMF's discretion: these were the famous conditionalities, detailed in the Structural Adjustment Programs. The IMF and its ultra-liberal experts took control of the borrowing countries' economic policies. A new form of colonization was thus instituted. It was not even necessary to establish an administrative or military presence; the debt alone maintained this new form of submission." International politics play an important role in IMF decision making. The clout of member states is roughly proportional to its contribution to IMF finances. The United States has the greatest number of votes and therefore wields the most influence. Domestic politics often come into play, with politicians in developing countries using conditionality to gain leverage over the opposition to influence policy. The IMF is only one of many international organisations, and it is a generalist institution that deals only with macroeconomic issues; its core areas of concern in developing countries are very narrow. One proposed reform is a movement towards close partnership with other specialist agencies such as UNICEF, the Food and Agriculture Organization (FAO), and the United Nations Development Program (UNDP). Jeffrey Sachs argues in The End of Poverty that the IMF and the World Bank have "the brightest economists and the lead in advising poor countries on how to break out of poverty, but the problem is development economics". Development economics needs the reform, not the IMF. He also notes that IMF loan conditions should be paired with other reforms—e.g., trade reform in developed nations, debt cancellation, and increased financial assistance for investments in basic infrastructure. IMF loan conditions cannot stand alone and produce change; they need to be partnered with other reforms or other conditions as applicable. The scholarly consensus is that IMF decision-making is not simply technocratic, but also guided by political and economic concerns. The United States is the IMF's most powerful member, and its influence reaches even into decision-making concerning individual loan agreements. The United States has historically been openly opposed to losing what Treasury Secretary Jacob Lew described in 2015 as its "leadership role" at the IMF, and the United States' "ability to shape international norms and practices". Reforms to give more powers to emerging economies were agreed by the G20 in 2010. The reforms could not pass, however, until they were ratified by the US Congress, since 85% of the Fund's voting power was required for the reforms to take effect, and the Americans held more than 16% of voting power at the time. After repeated criticism, the United States finally ratified the voting reforms at the end of 2015. The OECD countries maintained their overwhelming majority of voting share, and the United States in particular retained its share at over 16%. The criticism of the US-and-Europe-dominated IMF has led to what some consider 'disenfranchising the world' from the governance of the IMF. Raúl Prebisch, the founding secretary-general of the UN Conference on Trade and Development (UNCTAD), wrote that one of "the conspicuous deficiencies of the general economic theory, from the point of view of the periphery, is its false sense of universality." The role of the Bretton Woods institutions has been controversial since the late Cold War, because of claims that the IMF policy makers supported military dictatorships friendly to American and European corporations, but also other anti-communist and Communist regimes (such as Mobutu's Zaire and Ceaușescu's Romania, respectively). Critics also claim that the IMF is generally apathetic or hostile to human rights, and labour rights. The controversy has helped spark the anti-globalization movement. An example of IMF's support for a dictatorship was its ongoing support for Mobutu's rule in Zaire, although its own envoy, Erwin Blumenthal, provided a sobering report about the entrenched corruption and embezzlement and the inability of the country to pay back any loans. Arguments in favour of the IMF say that economic stability is a precursor to democracy; however, critics highlight various examples in which democratised countries fell after receiving IMF loans. A 2017 study found no evidence of IMF lending programs undermining democracy in borrowing countries. To the contrary, it found "evidence for modest but definitively positive conditional differences in the democracy scores of participating and non-participating countries." We need the World Bank, the IMF, all the big foundations, and all the governments to admit that, for 30 years, we all blew it, including me when I was president. We were wrong to believe that food was like some other product in international trade, and we all have to go back to a more responsible and sustainable form of agriculture. The FPIF remarked that there is a recurring pattern: "the destabilization of peasant producers by a one-two punch of IMF-World Bank structural adjustment programs that gutted government investment in the countryside followed by the massive influx of subsidized U.S. and European Union agricultural imports after the WTO's Agreement on Agriculture pried open markets." A 2009 study concluded that the strict conditions resulted in thousands of deaths in Eastern Europe by tuberculosis as public health care had to be weakened. In the 21 countries to which the IMF had given loans, tuberculosis deaths rose by 16.6%. In 2009, a book by Rick Rowden titled The Deadly Ideas of Neoliberalism: How the IMF has Undermined Public Health and the Fight Against AIDS, claimed that the IMF's monetarist approach towards prioritising price stability (low inflation) and fiscal restraint (low budget deficits) was unnecessarily restrictive and has prevented developing countries from scaling up long-term investment in public health infrastructure. The book claimed the consequences have been chronically underfunded public health systems, leading to demoralising working conditions that have fuelled a "brain drain" of medical personnel, all of which has undermined public health and the fight against HIV/AIDS in developing countries. In 2016, the IMF's research department published a report titled "Neoliberalism: Oversold?" which, while praising some aspects of the "neoliberal agenda," claims that the organisation has been "overselling" fiscal austerity policies and financial deregulation, which they claim has exacerbated both financial crises and economic inequality around the world. IMF policies have been repeatedly criticised for making it difficult for indebted countries to say no to environmentally harmful projects that nevertheless generate revenues such as oil, coal, and forest-destroying lumber and agriculture projects. Ecuador, for example, had to defy IMF advice repeatedly to pursue the protection of its rainforests, though paradoxically this need was cited in the IMF argument to provide support to Ecuador. The IMF acknowledged this paradox in the 2010 report that proposed the IMF Green Fund, a mechanism to issue special drawing rights directly to pay for climate harm prevention and potentially other ecological protection as pursued generally by other environmental finance. While the response to these moves was generally positive possibly because ecological protection and energy and infrastructure transformation are more politically neutral than pressures to change social policy. Some experts[who?] voiced concern that the IMF was not representative, and that the IMF proposals to generate only US$200 billion a year by 2020 with the SDRs as seed funds, did not go far enough to undo the general incentive to pursue destructive projects inherent in the world commodity trading and banking systems—criticisms often levelled at the World Trade Organization and large global banking institutions. In the context of the European debt crisis, some observers[who?] noted that Spain and California, two troubled economies within Europe and the United States, and also Germany, the primary and politically most fragile supporter of a euro currency bailout would benefit from IMF recognition of their leadership in green technology, and directly from Green Fund-generated demand for their exports, which could also improve their credit ratings. Both Lagarde and her two predecessors Strauss-Kahn and Rato have been investigated by the authorities and have either faced trial or are scheduled to go on trial for a variety of offences. Lagarde had been accused of giving preferential treatment to businessman-turned-politician Bernard Tapie as he pursued a legal challenge against the French government. At the time, Lagarde was the French economic minister. Within hours of her conviction, in which she escaped any punishment, the fund's 24-member executive board put to rest any speculation that she might have to resign, praising her "outstanding leadership" and the "wide respect" she commands around the world. Rato was arrested on 16 April 2015 for alleged fraud, embezzlement and money laundering. On 23 February 2017, Rato was found guilty of embezzlement and sentenced to 4​1⁄2 years' imprisonment. In September 2018, the sentence was confirmed by the Supreme Court of Spain. In March 2011, the Ministers of Economy and Finance of the African Union proposed to establish an African Monetary Fund. At the 6th BRICS summit in July 2014 the BRICS nations (Brazil, Russia, India, China, and South Africa) announced the BRICS Contingent Reserve Arrangement (CRA) with an initial size of US$100 billion, a framework to provide liquidity through currency swaps in response to actual or potential short-term balance-of-payments pressures. In 2014, the China-led Asian Infrastructure Investment Bank was established. Life and Debt, a documentary film, deals with the IMF's policies' influence on Jamaica and its economy from a critical point of view. Debtocracy, a 2011 independent Greek documentary film, also criticises the IMF. Portuguese musician José Mário Branco's 1982 album FMI is inspired by the IMF's intervention in Portugal through monitored stabilisation programs in 1977–78. In the 2015 film, Our Brand Is Crisis, the IMF is mentioned as a point of political contention, where the Bolivian population fears its electoral interference. ^ a b c "About the IMF". IMF. Retrieved 14 October 2012. ^ Boughton 2001, p. 7 n.5. ^ "Christine Lagarde Appoints Gita Gopinath as IMF Chief Economist". ^ "Factsheet: The IMF and the World Bank". IMF. 21 September 2015. Retrieved 1 December 2015. ^ "About the IMF Overview". www.imf.org. Retrieved 1 August 2017. ^ Broughton, James (2002). "IMF working paper" (PDF). imf.org. ^ a b c Lipscy 2015. ^ "The IMF at a Glance". www.imf.org. Retrieved 15 December 2016. ^ Schlefer, Jonathan. "There is No Invisible Hand". Harvard Business Review. Harvard Business Review. ^ Escobar, Arturo (1980). "Power and Visibility: Development and the Invention and Management of the Third World". Cultural Anthropology 3 (4): 428–443. ^ "imf.org: "Articles of Agreement, International Monetary Fund" (2011)" (PDF). ^ "Articles of Agreement of the International Monetary Fund – 2016 Edition". ^ "About the IMF". International Monetary Fund. Retrieved 12 March 2012. ^ a b Isard, Peter (2005). Globalization and the International Financial System: What's Wrong and What Can be Done. New York: Cambridge University Press. ^ a b c d e f g h Jensen, Nathan (April 2004). "Crisis, Conditions, and Capital: The Effect of the IMF on Direct Foreign Investment". Journal of Conflict Resolution. 48 (48): 194–210. doi:10.1177/0022002703262860. ^ a b c d e f g h i Chorev, Nistan; Sarah Babb (2009). "The crisis of neoliberalism and the future of international institutions: a comparison of the IMF and the WTO". Theory and Society. 38 (5): 459–484. doi:10.1007/s11186-009-9093-5. ^ Fischer, Stanley (March 2003). "Financial Crises and Reform of the International Financial System". Review of World Economics. Springer Publications. ^ "Factsheet: IMF Lending". About the IMF. International Monetary Fund. Retrieved 8 April 2012. ^ a b c Bossone, Biagio. "IMF Surveillance: A Case Study on IMF Governance" (PDF). Independent Office of the International Monetary Fund. ^ "Factsheet: IMF Surveillance". About the IMF. International Monetary Fund. ^ "Press Release: Macao SAR Begins Participation in the IMF's General Data Dissemination System". ^ Guimaraes, Bernardo; Iazdi, Oz (2015). "IMF conditionalities, liquidity provision, and incentives for fiscal adjustment". International Tax and Public Finance. 22 (5): 705–722. doi:10.1007/s10797-014-9329-9. ^ a b c Buira, Ariel (August 2003). "An Analysis of IMF Conditionality". G-24 Discussion Papers. United Nations Conference on Trade and Development (22). ^ "Factsheet: IMF Conditionality". About the IMF. International Monetary Fund. Retrieved 18 March 2012. ^ a b c d Khan, Mohsin S.; Sunil Sharm (24 September 2001). "IMF Conditionality and Country Ownership of Programs" (PDF). IMF Institute. ^ a b Jensen, Nathan (2004). "Crisis, Conditions, and Capital: The Effect of the International Monetary Fund on Foreign Direct Investment". Journal of Conflict Resolution. 48 (2): 194–210. doi:10.1177/0022002703262860. ^ a b c "Cooperation and Reconstruction (1944–71)". About the IMF. Retrieved 18 March 2012. ^ "IMF History and Structural Adjustment Conditions". UC Atlas of Global Inequality. Economic Crises. Archived from the original on 22 April 2012. Retrieved 18 March 2012. ^ Somanath, V.S. (2011). International Financial Management. p. 79. ISBN 978-93-81141-07-6. ^ a b De Vries, Margaret G (1986). The IMF in a Changing World: 1945–85. pp. 66–68. ISBN 978-1-4552-8096-4. ^ Kenwood, George; Lougheed, Alan (2002). Growth of the International Economy 1820–2000: An Introductory Text. p. 269. ISBN 978-0-203-19935-0. ^ Fund, International Monetary (2002). Imf Survey No. 13 2002. International Monetary Fund. ISBN 978-1-4552-3157-7. ^ Reinhart, Carmen M.; Trebesch, Christoph (2016). "The International Monetary Fund: 70 Years of Reinvention". Journal of Economic Perspectives. 30 (1): 3–28. doi:10.1257/jep.30.1.3. ISSN 0895-3309. ^ "Press Release: IMF Executive Board Approves €30 Billion Stand-By Arrangement for Greece". ^ "Quarterly Report to Congress on International Monetary Fund Lending: 1st Qtr 2012" (PDF). www.treasury.gov. ^ País, Ediciones El (1 February 2014). "Berlín y París incumplen con Grecia". ^ Ehrenfreund, Max (27 March 2013). "Cypriot banks to reopen amid criticism of bailout". The Washington Post. ^ "Cyprus disaster shines light on global tax haven industry no". MSNBC. 26 March 2013. Retrieved 2 April 2013. ^ Jan Strupczewski; Annika Breidthardt (25 March 2013). "Last-minute Cyprus deal to close bank, force losses". Reuters. Retrieved 25 March 2013. ^ "Eurogroup signs off on bailout agreement reached by Cyprus and troika". Ekathimerini. Greece. 25 March 2013. Retrieved 25 March 2013. ^ a b "Sovereign Debt Restructuring – Recent Developments and Implications for the Fund's Legal and Policy Framework" (PDF). imf.org. 26 April 2013. ^ a b "IMF Executive Board Discusses Sovereign Debt Restructuring – Recent Developments and Implications for the Fund's Legal and Policy Framework". IMF Public Information Notice. ^ a b Stevis, Matina (24 May 2013). "IMF Searches Soul, Blames Europe". ^ "Fiscal Monitor: "Taxing Times" Oct 2013, p. 49" (PDF). ^ "IMF: "Fiscal Affairs and Income Inequality" 23 Jan 2014" (PDF). ^ "Ukraine to get $15bn as Russia hit by downgrades". ^ "Windfall for hedge funds and Russian banks as IMF rescues Ukraine". ^ "IMF – Country Information". ^ "Republic of Kosovo is now officially a member of the IMF and the World Bank". The Kosovo Times. 29 June 2009. Archived from the original on 2 July 2009. Retrieved 29 June 2009. Kosovo signed the Articles of Agreement of the International Monetary Fund (IMF) and the International Bank for Reconstruction and Development (the World Bank) on behalf of Kosovo at the State Department in Washington. ^ "Kosovo Becomes the International Monetary Fund's 186th Member" (Press release). International Monetary Fund. 29 June 2009. Retrieved 29 June 2009. ^ Andrews, Nick; Bob Davis (7 May 2009). "Kosovo Wins Acceptance to IMF". The Wall Street Journal. Retrieved 7 May 2009. Taiwan was booted out of the IMF in 1980 when China was admitted, and it hasn't applied to return since. ^ "World Economic Outlook Database for April 2012 – Country information". Imf.org. 17 April 2012. Retrieved 7 November 2012. ^ "II The IMF and the Transition from Central Planning" (PDF). International Monetary Fund. p. 255. Retrieved 1 October 2012. ^ "What is the IMF?". Telegraph. 12 April 2011. ^ "Obligations and Benefits of IMF Membership". Money Matters: An IMF Exhibit – The Importance of Global Cooperation. International Monetary Fund. Retrieved 2 December 2018. ^ a b c "Governance Structure". About the IMF: Governance. Retrieved 18 March 2012. ^ a b "Factsheet: Guide to Committees, Groups, and Clubs". About the IMF. International Monetary Fund. ^ a b "IMF Executive Directors and Voting Power". Member Quotas Shares, Governors, and Voting Power. International Monetary Fund. ^ "Press Release: The IMF's 2008 Quota and Voice Reforms Take Effect". ^ "Press Release: IMF Board of Governors Approves Major Quota and Governance Reforms". ^ "Press Release: IMF Executive Board Approves Major Overhaul of Quotas and Governance". ^ a b Harding, Robin (24 May 2011). "Brics say European IMF claim 'obsolete'". The Financial Times. Retrieved 17 June 2011. ^ Woods 2003, pp. 92–114. ^ Mallaby, Sebastian (9 June 2011). "Can the BRICs Take the IMF?". Foreign Affairs. ^ "IMF Managing Director Dominique Strauss-Kahn Resigns". Press Release No. 11/187. International Monetary Fund. Retrieved 14 June 2011. ^ "IMF Executive Board Selects Christine Lagarde as Managing Director". Press Release. IMF. 28 June 2011. Retrieved 28 June 2011. ^ "France's Lagarde elected new IMF chief". Reuters. 28 June 2011. Retrieved 28 June 2011. ^ "IMF's Lagarde re-elected to second term". Deutsche Welle. Reuters, AFP. 19 February 2016. Retrieved 25 August 2016. ^ "Membership". About the IMF. International Monetary Fund. Retrieved 18 March 2012. ^ a b c d e f Blomberg & Broz 2006. ^ "IMF Members' Quotas and Voting Power, and IMF Board of Governors". ^ IMF IMF Managing Director Christine Lagarde Welcomes U.S. Congressional Approval of the 2010 Quota and Governance Reforms, Press release No. 15/573, 18 December 2015. ^ Stiglitz and Members of a UN Commission on Financial Experts, Joseph E. (2010). The Stiglitz Report: Reforming the International Monetary and Financial Systems in the Wake of the Global Crisis. New York: The New Press. ^ "Factsheet: IMF Quotas". About the IMF. The International Monetary Fund. ^ Kafka, Alejandre (September 1991). "Some IMF Problems after the Committee of Twenty". International Financial Policy: Essays in honour of Jaques J. Polack. Retrieved 2 December 2018. ^ a b Mukherjee, Bumba (2008). "International Economic Organizations and Economic Development". SAIS Review of International Affairs. 28 (2): 123–137. doi:10.1353/sais.0.0013. ^ Taylor, John (26 March 2014). "Why the IMF's Exceptional Access Framework is So Important". ^ "WSJ" – via online.wsj.com. ^ a b c Derber, Charles (2002). People Before Profit. New York: Picador. ^ Alexander, Titus (1996). Unravelling Global Apartheid: an overview of world politics. Polity press. pp. 127–133. ^ McCorquodale, Robert; Richard Fairbrother (August 1999). "Globalization and Human Rights". Human Rights Quarterly. 21 (3): 735–766. doi:10.1353/hrq.1999.0041. ^ Alexander, Titus (1996). Unravelling Global Apartheid: an overview of world politics. Polity press. p. 133. ^ "The IMF and the Third World". ODI briefing paper. Overseas Development Institute. Archived from the original on 7 January 2012. Retrieved 6 July 2011. ^ "Economic debacle in Argentina: The IMF strikes again". Twnside.org.sg. Archived from the original on 3 March 2010. Retrieved 30 May 2010. ^ Stephen Webb, "Argentina: Hardening the Provincial Budget Constraint", in Rodden, Eskeland, and Litvack (eds. ), Fiscal Decentralization and the Challenge of Hard Budget Constraints (Cambridge, Massachusetts: MIT Press, 2003). ^ "Ultimate Profit Solution Review by Toshko Raychev". SCI Trading. Archived from the original on 24 November 2016. ^ "Tăriceanu: FMI a făcut constant greşeli de apreciere a economiei româneşti – Mediafax". Mediafax.ro. Retrieved 30 May 2010. ^ Godfrey Mwakikagile (2006). Africa is in a Mess: What Went Wrong and what Should be Done. New Africa Press. pp. 27–. ISBN 978-0-9802534-7-4. ^ "Reflections on Leadership in Africa – Forty Years After Independence" (PDF). houseofknowledge.org.uk. Retrieved 14 May 2014. ^ "RBI Guv Raghuram Rajan blasts IMF for being soft on easy money policies of West". 19 October 2015. Archived from the original on 22 October 2015. ^ Choudhury, Suvashree. "RBI chief Rajan urges IMF to act against 'extreme' policies". ^ "RBI's Raghuram Rajan urges IMF to act against 'extreme' policies". ^ a b c d e f g Sachs, Jeffrey (2005). The End of Poverty. New York: The Penguin Press. ^ Stiglitz, Joseph E. (2006). Making Globalization Work. Great Britain: Allen Lane: an imprint of the Penguin Group. ^ Garuda, Gopal (1998). The distributional effects of IMF program. Cambridge: The Harvard university. ^ Hertz, Noreena. The Debt Threat. New York: Harper Collins Publishers, 2004. ^ a b Stiglitz, Joseph. Globalization and its Discontents. New York: WW Norton & Company, 2002. ^ More by Benjamin M. Friedman (15 August 2002). "Globalization: Stiglitz's Case". Nybooks.com. Retrieved 30 May 2010. ^ Toussaint and Millet (2010). Debt, The IMF, and The world Bank. Monthly Review Press U.S. p. 83. ^ Vreeland, James (2007). The International Monetary Fund (IMF): Politics of Conditional Lending. UK: Taylor & Francis Books UK. ^ Breen 2013, p. 13. ^ Oatley & Yackee 2004. ^ a b Donnan, Shawn; Dyer, Geoff (17 March 2015). "US warns of loss of influence over China bank". ft.com. Retrieved 2 July 2015. ^ Jonathan Weisman (25 March 2014). "Senate Democrats Drop I.M.F. Reforms From Ukraine Aid". New York Times. Retrieved 9 April 2014. ^ "Britain urges U.S. Congress to stop blocking IMF reform". Yahoo. Reuters. 7 April 2014. Retrieved 9 April 2014. ^ Hughes, Krista (9 April 2014). "Australia treasurer 'disappointed' at U.S. impasse on IMF reform". Reuters. Retrieved 9 April 2014. ^ "Acceptances of the Proposed Amendment of the Articles of Agreement on Reform of the Executive Board and Consents to 2010 Quota Increase". imf.org. Retrieved 9 July 2015. ^ "IMF Members' Quotas and Voting Power, and IMF Board of Governors". imf.org. Retrieved 9 July 2015. ^ Mayeda, Andrew (12 May 2015). "Obama Seeks to Keep IMF Veto as China Influence Is Expanded". bloomberg.com. Retrieved 9 July 2015. ^ "IMF Managing Director Christine Lagarde Welcomes U.S. Congressional Approval of the 2010 Quota and Governance Reforms". imf.org. 18 December 2015. Retrieved 25 July 2017. ^ Weisbrot, Mark; Johnston, Jake (2016). "Voting Share Reform at the IMF: Will it Make a Difference?" (PDF). Washington, DC: Center for Economic and Policy Research. Retrieved 25 July 2017. ^ Dosman, J. Edgar (2008). The Life and Times of Raúl Prebisch, 1901-1986. McGill-Queen University Press, Montreal. pp. 248–249. ^ David van Reybrouck (2012). Congo: The Epic History of a People. HarperCollins. p. 374ff. ISBN 978-0-06-220011-2. ^ "IMF support to dictatorships". Committee for the Abolition of the Third World Debt. World Bank. Retrieved 21 September 2007. ^ a b Nelson, Stephen C.; Wallace, Geoffrey P.R. (1 December 2017). "Are IMF lending programs good or bad for democracy?". The Review of International Organizations. 12 (4): 523–558. doi:10.1007/s11558-016-9250-3. ISSN 1559-7431. ^ Oxfam, Death on the Doorstep of the Summit Archived 7 January 2012 at the Wayback Machine, August 2002. ^ "Destroying African Agriculture". Foreign Policy In Focus. 3 June 2008. Retrieved 22 August 2018. At the time of decolonization in the 1960s, Africa was not just self-sufficient in food but was actually a net food exporter, its exports averaging 1.3 million tons a year between 1966-70. Today, the continent imports 25% of its food, with almost every country being a net food importer. ^ International Monetary Fund Programs and Tuberculosis Outcomes in Post-Communist Countries Archived 20 September 2008 at the Wayback Machine PLoS Medicine. The study has not been independently verified, nor have the authors published parts of their supporting data. Retrieved 29 July 2008. ^ Rowden, Rick (2009). The Deadly Ideas of Neoliberalism: How the IMF has Undermined Public Health and the Fight Against AIDS. Zed Books. ISBN 978-1-84813-284-9. ^ Rowden, Rick (6 July 2016). "The IMF Confronts Its N-Word". Foreign Policy. Retrieved 22 October 2016. ^ "Financing the Response to Climate Change, Staff Position Note 10/06, March 25, 2010" (PDF). Retrieved 30 May 2010. ^ Robert, Adam (25 March 2010). "Finance: IMF Proposes 100-Billion-Dollar Climate Fund". Globalissues.org. Retrieved 30 May 2010. ^ "Tapie affair: Background to case". 22 July 2016 – via www.bbc.co.uk. ^ Petroff, Alanna (19 December 2016). "Christine Lagarde, IMF chief, guilty of negligence". ^ "IMF Bets on Lagarde as Trump Aims to Upend World Order". 20 December 2016 – via www.bloomberg.com. ^ «Rato, detenido en el registro de su vivienda en Madrid por supuestos delitos de fraude y blanqueo.» RTVE. Retrieved 16 April 2015. ^ "Spanish police search home and off ex-IMF chief Rodrigo Rato". BBC News. 16 April 2015. Retrieved 16 April 2015. ^ Jones, Sam (23 January 2017). "Former IMF chief gets four years in jail for embezzlement in Spain". The Guardian. Retrieved 24 February 2017. ^ "El Supremo confirma la condena de 4 años y seis meses de cárcel para Rodrigo Rato por las tarjetas black". eldiario.es (in Spanish). Retrieved 3 October 2018. ^ "AU discussions on African Monetary Fund". TradeMark Southern Africa. 16 March 2011. Archived from the original on 14 July 2014. Retrieved 5 July 2014. ^ "Sixth BRICS Summit – Fortaleza Declaration". VI BRICS Summit. 15 July 2014. Retrieved 15 July 2014. ^ Jhunjhunwala, Udita. "Film review: Our Brand is Crisis". livemint.com. Retrieved 7 March 2019. Lipscy, Phillip (2015). "Explaining Institutional Change: Policy Areas, Outside Options, and the BrettonWoods Institutions" (PDF). American Journal of Political Science. 59 (2): 341–356. CiteSeerX 10.1.1.595.6890. doi:10.1111/ajps.12130. Blomberg, Brock; Broz, J. Lawrence (17 November 2006). The Political Economy of IMF Voting Power (PDF). 2006 International Political Economy Society Meeting (IPES). Niehaus Center for Globalization & Governance, Woodrow Wilson School of Public and International Affairs. Boughton, James M. (2001). Silent Revolution: The International Monetary Fund 1979–1989. Washington, DC: International Monetary Fund. ISBN 978-1-55775-971-9. ——— (2012). Tearing Down Walls: The International Monetary Fund, 1990–1999. Washington, DC: IMF. ISBN 978-1-61635-084-0. Breen, Michael (2013). The Politics of IMF Lending. International Political Economy Series. Basingstoke and New York: Palgrave Macmillan. ISBN 978-1-137-26380-3. Broz, J. Lawrence; Hawes Brewster, Michael (2006). "US domestic politics and International Monetary Fund policy" (PDF). In Darren G. Hawkins et al. (eds. ), Delegation and Agency in International Organizations, pp. 77–106. Political Economy of Institutions and Decisions. Cambridge and New York: Cambridge University Press. ISBN 978-0-521-86209-7. Oatley, Thomas; Yackee, Jason (2004). "American Interests and IMF Lending" (PDF). International Politics. 41 (3): 415–429. doi:10.1057/palgrave.ip.8800085. Henke, Holger (2000). Between Self-determination and Dependency: Jamaica's Foreign Relations 1972-1989. Kingston, Jamaica: The United States of the West Indies Press. Woods, Ngaire (2003). "The United States and the International Financial Institutions: Power and Influence Within the World Bank and the IMF". In Rosemary Foot, S. Neil MacFarlane, and Michael Mastanduno, eds.,US Hegemony and International Organizations, pp. 92–114. Oxford and New York: Oxford University Press. ISBN 978-0-19-926142-0. Bordo, M.D. (1993). Bordo, M.D. ; Eichengreen, Barry (eds.). The Bretton Woods International Monetary System: A Historical Overview. A Retrospective on the Bretton Woods System. London. doi:10.7208/chicago/9780226066905.001.0001. ISBN 9780226065878.
deVries, Margaret Garritsen. The IMF in a Changing World, 1945–85, International Monetary Fund, 1986. James, H. International Monetary Cooperation since Bretton Woods, Oxford, 1996. Joicey, N. and Pickford, S. "The International Monetary Fund and Global Economic Cooperation" in Nicholas Bayne and Stephen Woolcock, The New Economic Diplomacy: Decision-Making and Negotiation in International Relations, (Ashgate Publishing, 2011). Keynes, J.M. The Collected Writings, Vol. XXVI. Activities 1941–1946: Shaping the Post-War World: Bretton Woods and Reparations, Cambridge, 1980. Skidelsky, R. John Maynard Keynes: Fighting for Britain, London, 2000. Weiss, Martin A. The International Monetary Fund. (Washington, DC: Congressional Research Service, 24 May 2018). "Proceedings and Documents of the United Nations Monetary and Financial Conference, Bretton Woods, New Hampshire, July 1–22, 1944"
"IMF and Ukraine found a compromise"
This page was last edited on 18 April 2019, at 16:03 (UTC).